The initial impression of Kagoshima is that this place is way dirtier than anywhere else in Japan, with a lot of dark gray dust everywhere, piling up against buildings and In the spaces between the bricks in the pavement. Only it’s not dirt. 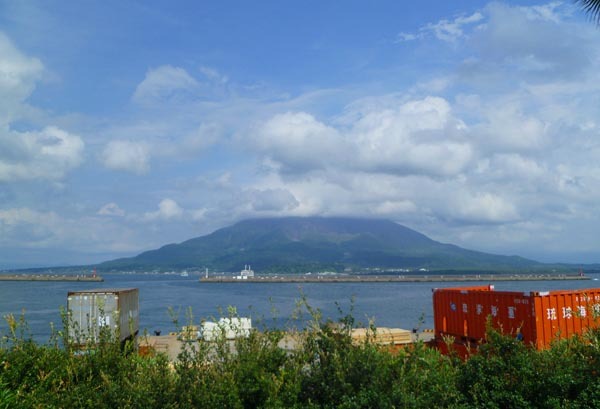 This city is just across the bay from the Sakurajima volcano and receives a constant influx of dust and granules that are either light enough or spewed high enough to be carried across the water to land on the mainland. this was one of the many tanks that brought on seafood cravings. 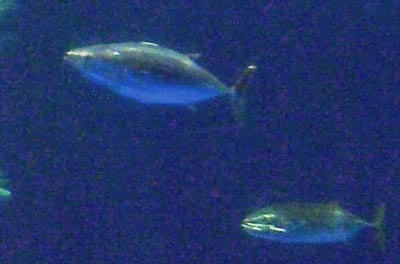 two new bonito species for me. I'm not sure if these are really bonitos based on what's shown in the next pic. 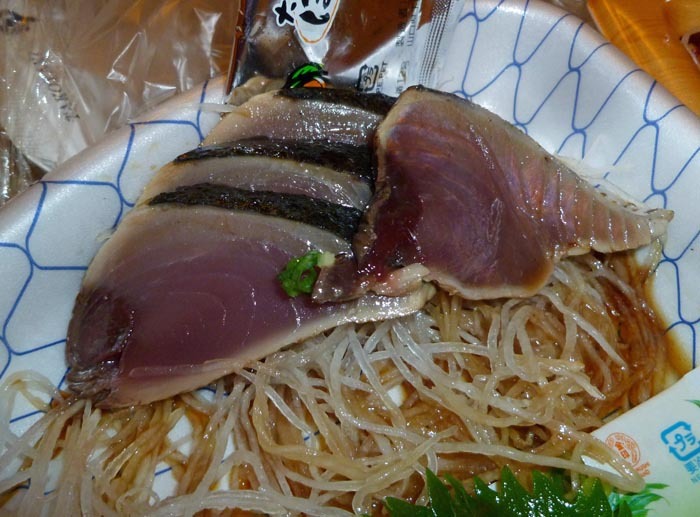 as shown in this cross section of Japanese bonito, the location of dark muscle is clearly medial rather than distal. This sample was acquired for research purposes only. This is also a sort of odd destination for us–I didn’t know exactly what would there would be for us to do here except just to walk around among people who might be not-too-distantly related to me. In this very informal retracing of my Japanese roots, Kagoshima is the only part that wasn’t just a train stop along the way to somewhere else (the others are Fukuoka, represented by our transfer at Hakata station, and Shizuoka, where I’m headed today to lodge part of my family while others of us take on Mount Fuji). I also wanted to visit Minamata, and this is only about half an hour south of there on the Shinkansen. From Kagoshima station, it’s a short walk to the port. The aquarium at Kagoshima is very nice. In the big tank they have a whale shark as well as several thunnids (including a couple of bluefin tuna and several species of bonito that I hadn’t seen before). I suspect that some of these “bonitos” (locally called “katsuo”) may actually be tunas, given the central position of dark muscle in the body. We also got to watch an electric eel hunt. 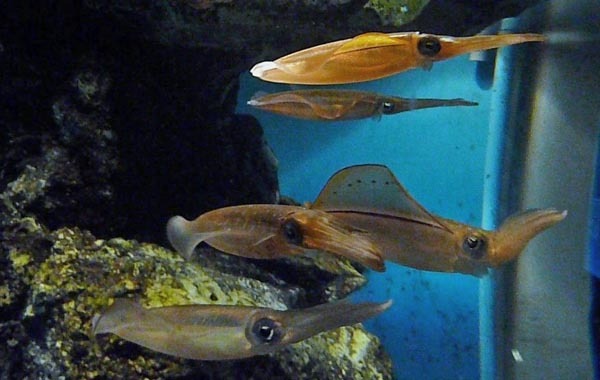 An aquarium staff member dropped a loach into the tank and when the “eel” (not rely an eel) sensed the presence of prey, it blasted out a 180V discharge (which was transduced into audio static and a visual voltimeter display). Only the loach was fast and swimming away from the eel it managed to survive three blasts before it was finally stunned enough for the mostly blind predator to stun it lethally (I.e., at close enough range) and have supper. 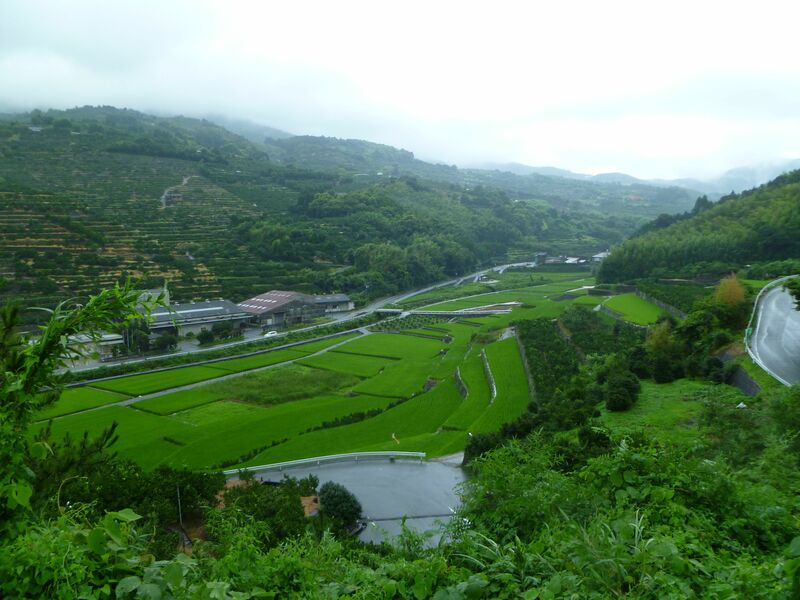 The southern part of Kyushu is served by Shinkansen (burret train), but it starts just south of Kumamoto in Shin-Yatsushiro. In order to cut a relatively straight path, though, they couldn’t actually get to most of the coastal cities located further out on peninsulas, and so the grid was set up with Shinkansen stations along the bullet rail route bearing the “shin-” prefix followed by the nearest major city: Shin-Osaka station is a five-minute ride to Osaka station, Shin-Minamata is just up the hill from Minamata city, and I’m guessing then that there is a city by the name of Yatsushiro somewhere nearby to this northern terminus of the southern Kyushu Shinkansen line. 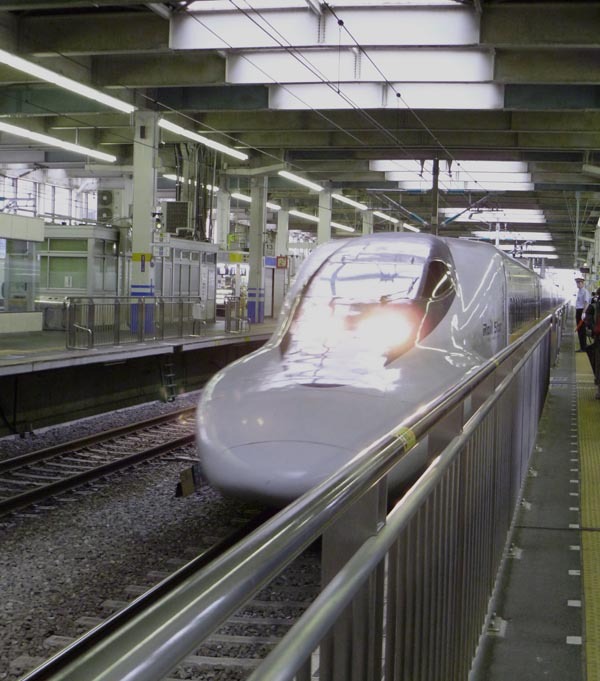 So in order to head south from Kumamoto, there is a relay express train that connects with the Tsubame Shinkansen at Shin-Yatsushiro, with stops at a lot of Shin- stations, Shin-Minamata is one of them. It’s a significant jog down the hill to the coast and south to Minamata. Buses run only about every hour, and we were lucky to catch one just right for the way down. 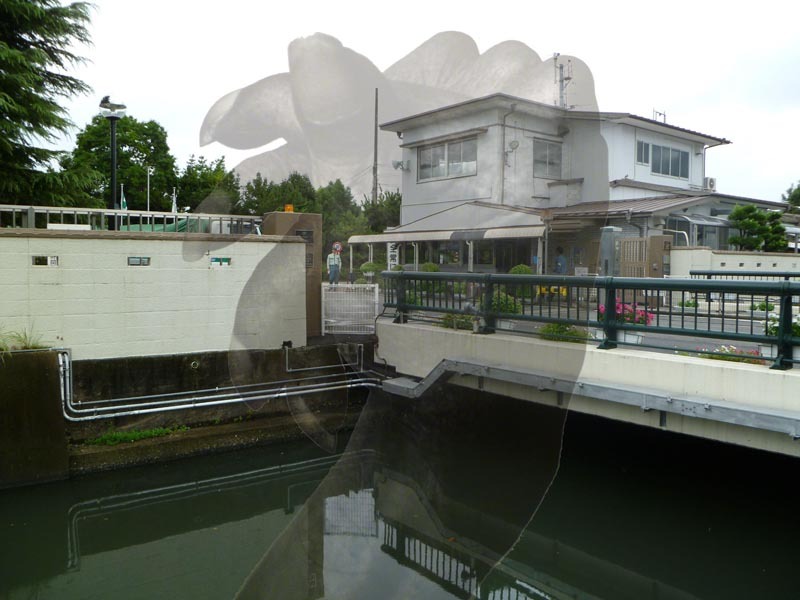 The polluters and the legacy of their victims continue to coexist in Minamata. We got off the bus at Minamata station, because it’s right across from the current entrance to the Chisso chemical facility, which plays maybe the most significant and nefarious role in the dark history of this little corner of Japan. There is a sentry guarding the compound’s entrance and a continual bustle of activity within. From this point it is over a kilometer further down the road to get to an enormous park built over the buried toxic sludge that was dredged out of the bay in an gargantuan cleanup project. The park is a happy place today with a bamboo garden, baseball park, jungle gyms and playgrounds, as well as a lot of open space wedged between the Chisso plant on one side and an enormous lumberyard on the other. If you’re familiar with the port of Long Beach, this is like any of those islands created from dredged sediment, another of our species’ modifications to the local topology. This place’s dark story can be found in almost any ecology textbook. 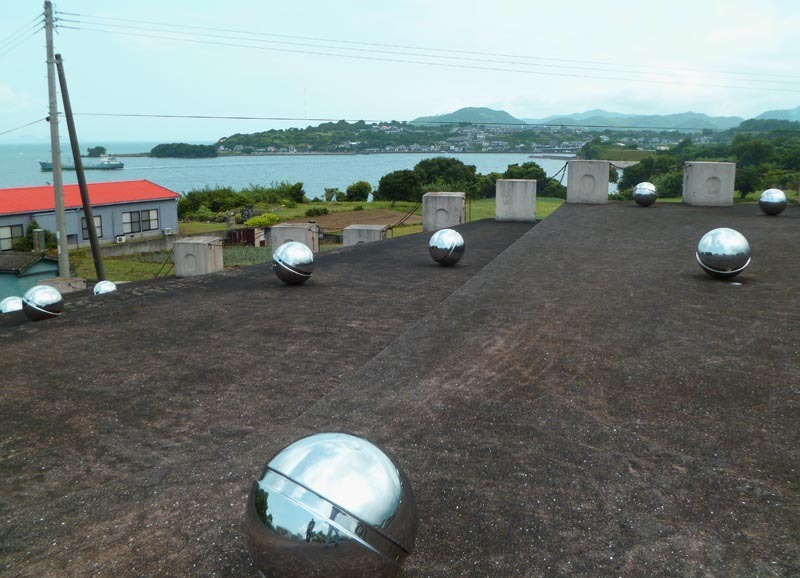 Beginning in the thirties, Chisso began discharging large quantities of methyl mercury, a by-product of their synthesis of acetaldehyde, directly into a river flowing into Minamata Bay. Within a year, sea life started dying, and shortly thereafter cats started dying after suffering through a period of spastic convulsions. In the early forties, mercury’s neuropathic effects started to appear in Minamata’s human population, which was heavily dependent on locally caught seafood. 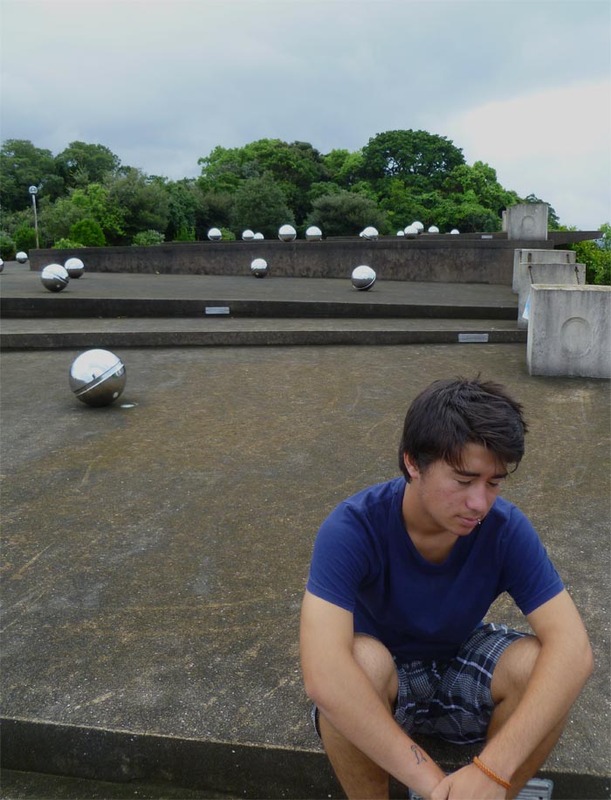 At the time of the discovery of this new “Minamata disease” its cause was unknown, and fearing a transmissible or genetic cause Minamata people were initially quarantined and subsequently subject to severe discrimination, which continues even today. Chisso scientists, however, knew of the role of Chisso’s mercury discharge, because they had run their own studies with cats during the period before the human cases started cropping up. Instead of doing the right thing of admitting their role and stopping the mercury discharge altogether, they instead kept this knowledge private and changed their toxic discharge point to a different river further to the north, where the mercury would be swept out by currents to affect a much larger area. I wonder if this is why you really don’t see a lot of oysters on menus in Kumamoto. There definitely was a dark weirdness about this whole scene. The silver balls (representing mercury?) seemingly cascading down steps and (perhaps) into the ocean was disturbing. All told the city of Minamata was hardest hit, with over a thousand certified cases of methyl mercury-related neuropathy with many, many more in outlying cities (one of which, Nagasaki, having its own terrifying day in 1945). Between the cleanup effort and compensation to victims and their survivors, Chisso has paid–and continues to pay–dearly for the nightmare it has caused. My mental image for Miyamoto Musashi will probably always be the face of that actor who played the great samurai (not Mifune) in the television serial based on his adventures back in the days of black-and-white TV. Yes, we had color back then, but this was an old series that came on whatever the public broadcast channel was back then–channel 18?–at 10 am on Saturdays. My buddy Mike Yamasaki got me hooked on it–Mike was really into martial arts and swords and nunchuks and stuff. This (and not Godzilla!) was probably my first exposure to Japanese media. 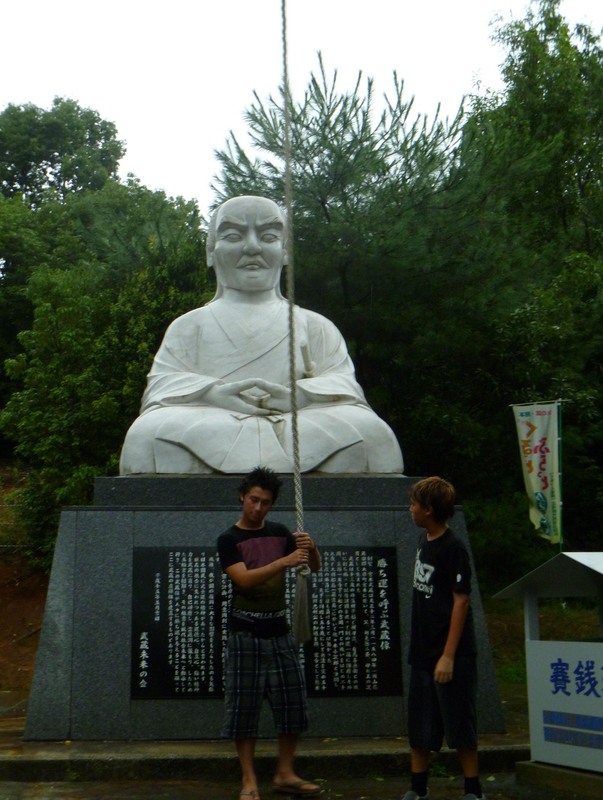 The real Musashi must have been a spectacular dude. Not only was he good enough at being a samurai to die at an old age of a natural causes, he was also a prolific artist, writer, and philosopher. 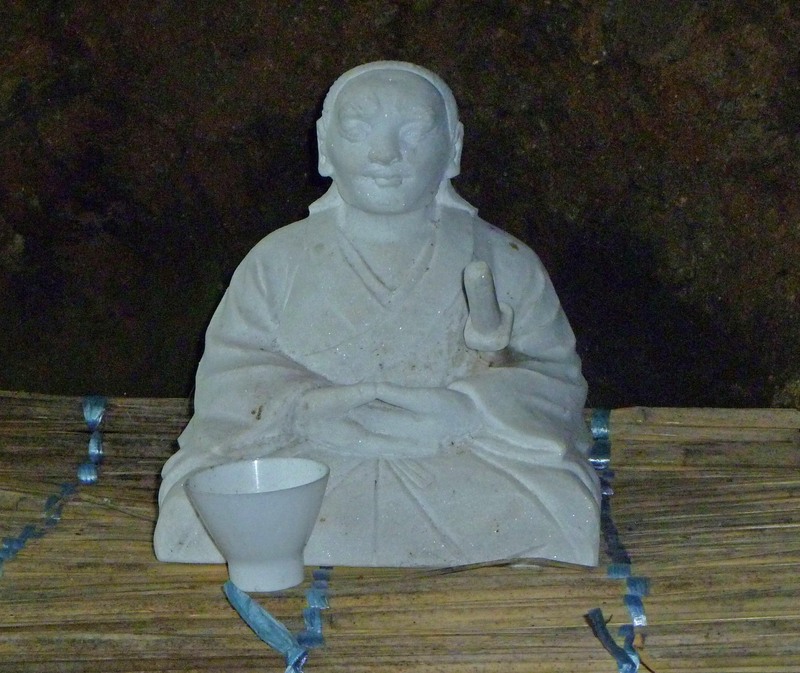 After a legendary career of shredding humans, he pursued various retirement activities in different parts of Japan, but this funny little cave in a hillside close to Kumamoto was a spot he favored for meditation. This spot and Kagoshima are my two main reasons for pulling our Japan trip in the direction of Kyushu, as opposed to something more temperate (e.g., northward where it would be cooler). 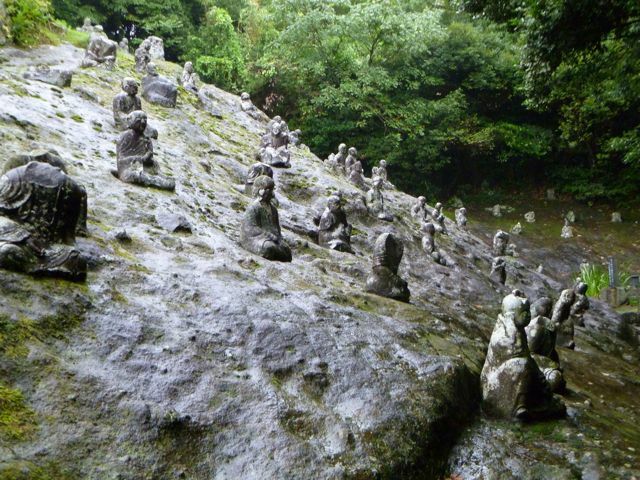 A nook in a rock once used by a legendary swordsman and places that my ancestors knew were the draw here. This was the "attraction" we found a kilometer up the road from the bus stop. 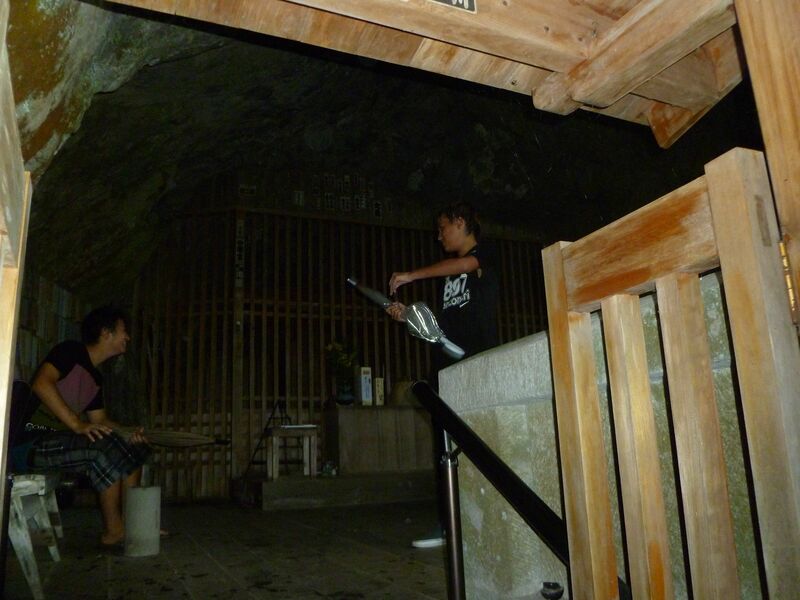 Fortunately, there was a sign there that showed the way to the Musashi cave in a way understandable to us. We got off the train at Kumamoto station and got a little wet walking just a block through some pretty gnarly weather to the hotel. Unlike most other places we’ve been, there isn’t much in the area around the JR station. The center of activity is closer to the Kotsu Center, which is also the hub of the city bus system. From Kotsu, we bought round-trip tickets for the bus out toward Reigando. It’s bus #6 that takes you out, and we were instructed by the ticket gal to pay close attention to the names of the stops, because there is no announcement in English–Iwato Kannon Iriguchi is where to get off after a long ride up a narrow and windy mountain road. There was no signage in English (or anything in pictures to direct us in the right direction) when we got off the bus–it looked like just another intersection of mountain roads. There was also a light rain falling, and the boys were not especially confident that this wouldn’t be Dad’s most spectacular screw-up as we took the steepest path uphill and started walking (this is usually a safe bet). To be honest, I wasn’t at all sure that this was the right way, but I knew there was something at 1 kilometer in this direction–this much I could get this much from a sign. The promised destination turned out to be a large Buddha statue, but there was also a little map indicating the directions to a place with lots of little buddhas on a hillside–this I remembered as a landmark on the trail up to Musashi’s cave–200 meters down one footpath and about 300 meters up after a sharp right turn. This was it (little sigh of relief)–Dad’s sense of direction wins for once. the cave itself is the size of a small room. there's a shrine and a little statue, and that's about it. 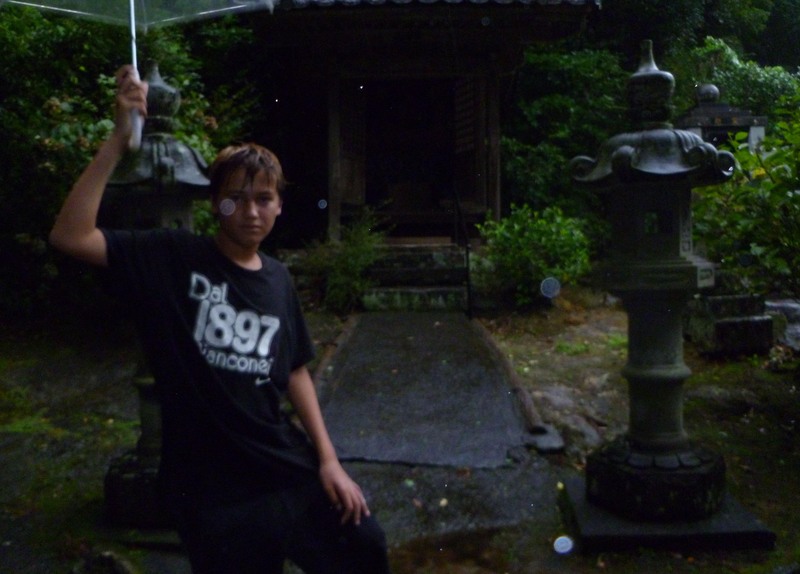 The guy who sold us tickets to Gohyakurakkan (which I think refers to the little buddhas on the hill–500 of them) also took pity and loaned us umbrellas. 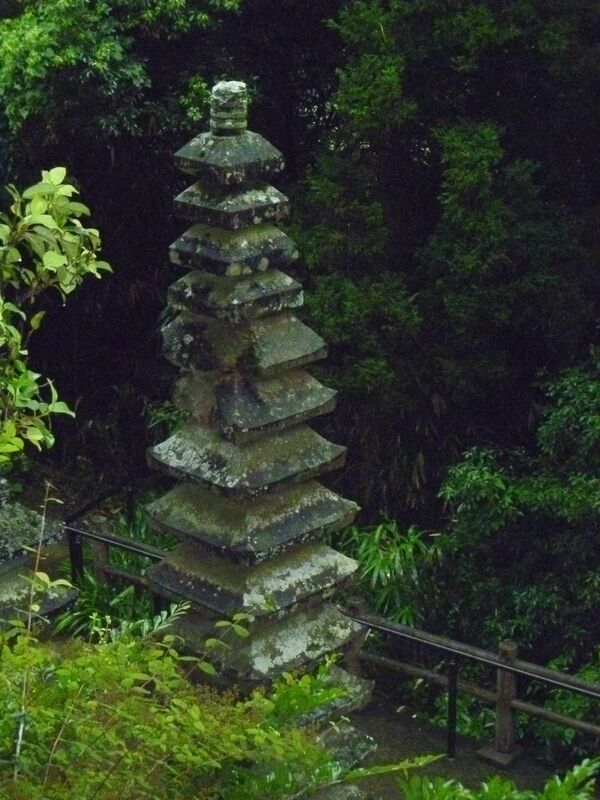 The last bit of trail was short but steep, with rustic stairs chipped crudely into the stone mountainside and made a bit treacherous by the rain and considerably less treacherous by the sturdy handrails that have been installed–I’m sure that Musashi had handrails as well, right? The cave offered a nice shelter from the elements as well as a beautiful view. There was a shrine with sake bottles (one box had a picture of the samurai) and a little statue of an aged Musashi, round, wrinkled and toothless, looking nothing like the guy on TV I remember. The return trip to Kumamoto was another adventure. It was “raining balls” (as my kids say), and we missed the penultimate bus, and this meant we had nearly two hours to wait for the last bus which was due at 5:29. We paused for a while in a semi-sheltered spot on the way down, but with the wind changing direction every so often it wasn’t all that great–not so worried about staying dry at this point (way too late for that), we were mostly concerned about our electronics–iPhone, iPad, and iPods–which were needed distractions for the long wait and protected only by my leather man-purse. 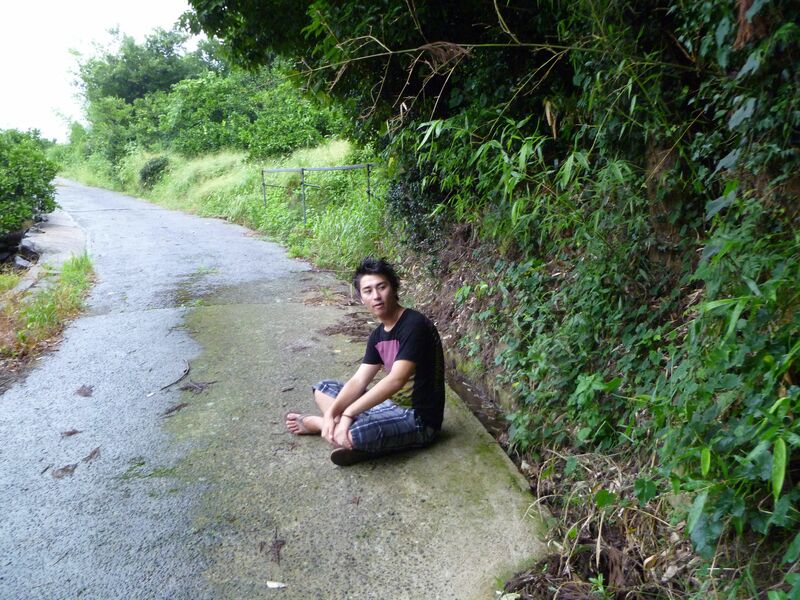 we waited for a while in this sort-of sheltered spot, a couple hundred meters up the road from the bus stop. Near the intersection there was a fire station with a large covered porch, and we waited there for a while, before a fireman came out to ask what we were doing. When I managed to communicate that we were waiting for the bus (“basu”), he let us wait in the station but kept popping over to see what we were doing. He brought us coffee and ultimately said he would call us a cab, at which time we left the station to go wait at the bus stop for the last 45 minutes. There was a little spider-y shed near a house that gave us some shelter when the rain got heavy. The last bus was precisely on time and we made it back to Kumamoto in time to catch some ramen before bedtime.